We all do from time to time, but it becoming a chronic condition for more and more of us. Julie Gray wants to help you turn down the volume of stress and anxiety in your life by getting you to relate to your thoughts a new way. After all, we are most often the source of our own stress. 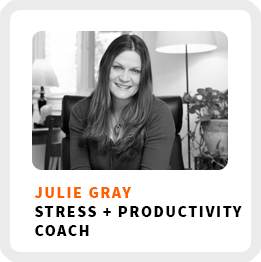 Julie is a stress and time management coach. You can learn more about her work at Profound Impact. Not only does she want to help you chill out, she also wants to help you find your own version of productivity. Why starting a meditation practice is such an important method for reducing your stress. Why the secret to becoming more productivity lies within yourself. Why most of us speed up to deal with our stress when stopping is the better option. Reframing your mindset and how you relate to your thinking. Core work activities + habits: 1) Do outreach and connect with people. 2) Work with clients. 3) Periodically step away. Ideal work environment: Her tiny cottage on a horse farm with a view of nature. Self-reflection practice: Writing and talking through things. Book recommendation: The Little Book of Big Change by Dr. Amy Johnson. Regains focus by: Taking a break or working with a client. 90-day goal: Fill up the pipeline for more training within organizations. 1) Reach out to other coaches: See who you resonate with and see the different variations of coaching. 2) Check out the International Coach Federation (ICF): Understand the things required of you to be a coach. 3) Know that coaching is about creating space for helping another person: It’s not always about knowing answers and giving directions.